A sickly Harvard student. A Maine Guide. And a friendship that changed a man – who changed a nation. Today we think of Theodore Roosevelt as a larger-than-life figure, but before he became a legendary outdoorsman, Badlands rancher, Rough Rider, trust buster, and political maverick, he was a “thin pale youngster with bad eyes and a weak heart,” in the words of William Wingate Sewall, the upcountry Maine woodsman who would become Roosevelt’s mentor and lifelong friend. The two met at a crucial time in Roosevelt’s life, and Sewall exerted a quiet but profound influence on the man who would become America’s twenty-sixth President. BTR now recommended reading by the Smithsonian. I’ll take that. Boothbay’s Coastal Maine Botanical Gardens – called the best public garden in the nation on TripAdvisor – started a program designed to get kids outside and into the natural world inspired by Becoming Teddy Roosevelt. The Lunder New Naturalists Program had 19 middle schools and more than 600 kids involved, from Sanford to Fort Fairfield, with teachers using the story of TR and his visits to Maine as a way to explore biodiversity and conservation. Becoming Teddy Roosevelt was just listed on the Best USA History Books webpage! A spate of reviews at Amazon lately by some of the bookseller’s top reviewers: “A stellar work of historiography,” writes one. “[W]onderfully written,” says another. ” “A remarkable book about two remarkable men,” says one more. “Probably the best book I’ve read in the past twelve months,” says yet another. If you enjoyed Becoming Teddy Roosevelt, please write a review yourself. Check out the BTR book trailer at YouTube! “I’ve been doing the show 10 years, 400 authors, and I’m going to put this in the top ten. It’s a classic page-turner.” Johnny Kosnow, WRFR’s Open Book, on Becoming Teddy Roosevelt. Part two of my Book Life interview. A new interview on the fine writing blog, Book Life. Check it out. Becoming Teddy Roosevelt is a 2010 Book of the Year Award finalist! And again! Another week on the Bestseller List! Maine Sunday Telegram, 12/26/10. Back on the Bestseller List! Maine Sunday Telegram 12-19-10 – #7 hardcover non-fiction between 6. Jon Stewart and 8. Glenn Beck! Becoming Teddy Roosevelt honored by the Maine State Legislature! Another mention in the Bangor Daily News. 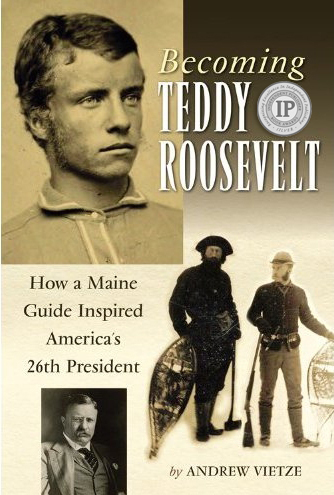 “Andrew Vietze’s new book Becoming Teddy Roosevelt is a gift to all TR fans. . . ” –Wellesley Free Library blog, where librarians blog about their favorite books. Check out the new interview at Art of Manliness.com! Yipee we won an IPPY! BTR takes a Silver at the Independent Publisher Book Awards in New York! Great new review in the Maine Sunday Telegram. New mention in the Boston Globe. Find Becoming Teddy Roosevelt on Facebook!